In my clinics, I see a lot of people with Irritable Bowel Syndrome (IBS). Each person has a different treatment and needs a different dietary approach but many trial the low FODMAP diet, which is the second phase of the NICE guidelines recommendations for the management of IBS. Today in clinic, I have a few people starting off on their low FODMAP diet. I always recommend buying the Monash University FODMAPs App, (I am Monash University FODMAPs trained), but people tend to find those first few days quite a struggle when trying to plan meals. My advice would be – don’t start until you have planned your week. Having regular, stress free meals is a vital part of the plan. 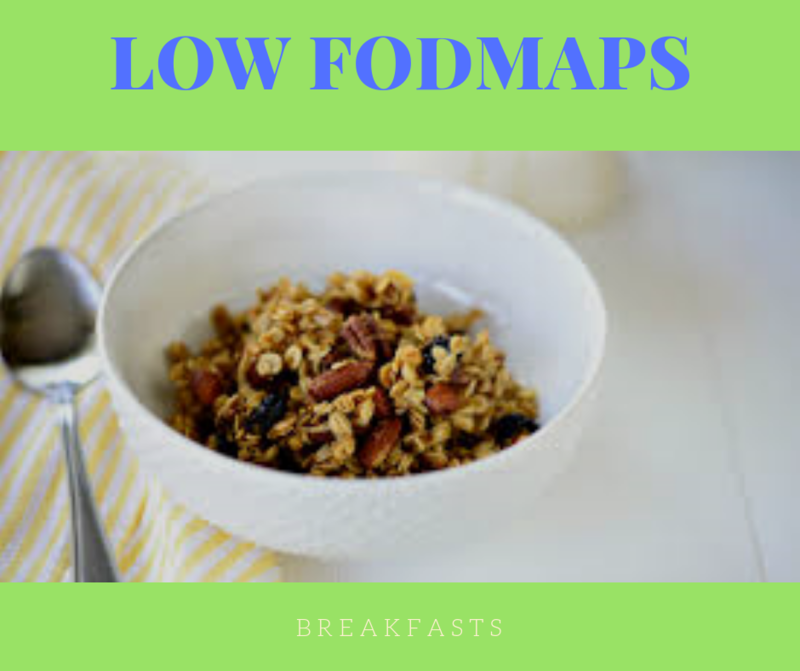 Here are a just a few simple low FODMAP breakfasts that I usually recommend. Or you can try some of these recipes. (I’ve been using these so long, I can’t recall where I originally found them). Pre-heat the oven to 150 degrees/fan. Add all the dry ingredients – except the coconut – into a bowl. Mix the wet ingredients in a small bowl and then add the dry ingredients. Mix everything together thoroughly – you will think there isn’t enough liquid but keep mixing and it will definitely all come together. Spread the mix onto two baking trays (I would also use baking paper). Bake for 15 mins and then mix in the coconut. Cook for another 10 mins. Once the granola has turned a light golden brown take out of the oven and tip onto a flat dish to cool. You can store in an airtight container for four weeks. Add the coconut milk (lactose free milk or milk substitute), maple syrup, vanilla essence, and three quarters of a tablespoon of cocoa powder to a mason jar or small bowl. Whisk or stir well with a fork until the cocoa powder is well combined and no longer lumpy. Just before serving, stir well to break up any lumps. Then add a serve of your favourite low FODMAP fruit. You can adjust the sweetness as desired. Store for up to 5 days in the fridge. Chop the strawberries into halves or quarters. Place the coconut milk (lactose free milk or milk alternative), frozen strawberries, vanilla soy ice cream (lactose free ice cream or lactose free yoghurt), chia seeds, maple syrup, lemon juice, and vanilla essence in the blender. If using fresh strawberries make sure you add some ice cubes.